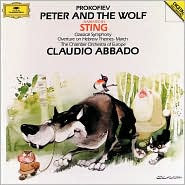 At least once a year, usually in the summer, my local NPR station will play a version of Prokofiev's Peter And The Wolf. The one they aired this week was narrated by Sting. Seriously cool. I've loved this symphony since I was a girl and have enjoyed many narrators, from Sir John Gielgud to David Bowie. Sting's version stands up beautifully and I am fairly certain we'll be adding it to our collection. At once sweet and dramatic, this is a perfect introduction for any child to the world of classical music, as well as the art of storytelling.